Recently I've been thinking about the dreaded curse of perfectionism, which seems to have been with me forever. It was definitely there at school; my reports said so. It can be frustrating, this drive to make everything Just Right, and sometimes the task seems just too daunting, which leads to the other P word - procrastination. Those two need their own portrait, drawn standing glumly hand in hand! I usually come up against Mr P when I'm drawing or designing. That's why these days I'm trying to work fast, get it all out there and go back and nitpick later - otherwise nothing would ever get finished. This week I'm about to jump into five weeks of intense art making in illustration agent Lilla Rogers' online course 'Make Art that Sells.' With a new deadline each week, there's going to be no time for me to faff around trying to make things perfect. And that, as hard as it might be, is probably exactly what's needed. Hi, Carla, maybe perfectionism, is which always played against (to put it in sports terms) of our creative freedom. I suffered a lot of this "disease" and I think that is partly because we are never satisfied with what we do ... Why? Because we compare what we do with what others do, If what others do, is worse than ours, ours has (necessarily) to be better. And if what others do is better than ours, we will want to reach that level. Finally: Perfectionism kill our creative happiness. For some time, I think I solved: I know that I like what I do, and do not intend to go further. Only, improve my style and my art to grow my own language. Roberto - it's an ongoing challenge but I think becoming aware of all those mad thoughts makes it easier to deal with. This week has definitely been a rollercoaster of all the things you've mentioned! I like your idea of 'growing your own language.' That's great. And thank you...I like knowing that there are other people in the same boat - it makes dealing with it easier, somehow. 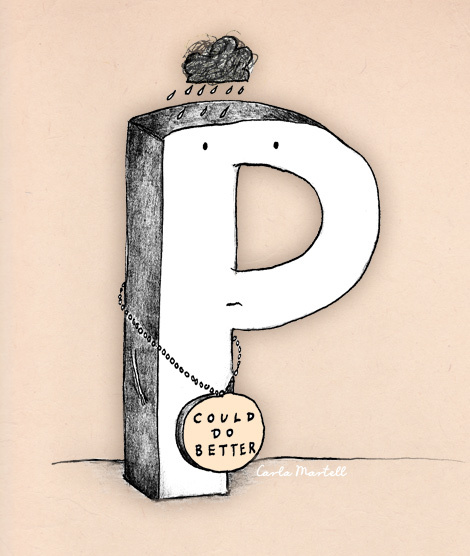 Hope you're making headway on your project and not letting the two deadly P's get to you too much!